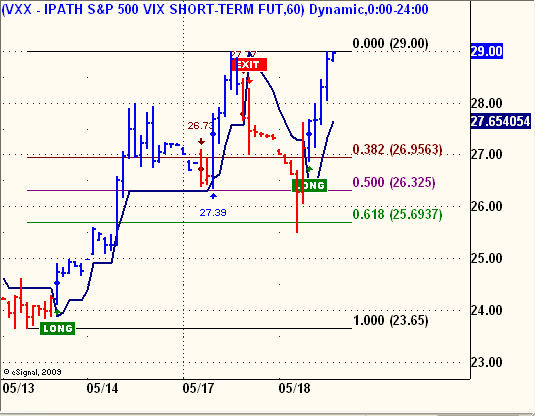 Here is a continuation of the VXX chart posted earlier today. 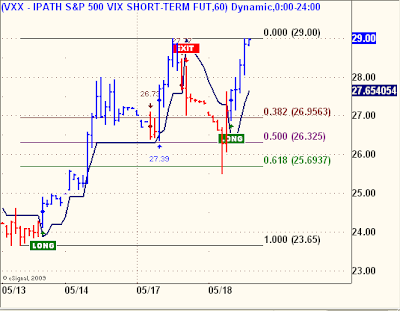 VXX traded down to the 0.618 level and bounced strongly. Either its breaking out big time and the market is in deep trouble, or it is making a double top and about to fall, thus suggesting a market recovery. Biotech basket was down today. AVXL up 14 % today. VVUS is prominently featured on CNBC documentary tonight. If VVUS can bring its obesity drug to full approval, it can be one of the best selling drugs ever. IHS replied, "When evening comes, you say, 'It will be fair weather, for the sky is red,' and in the morning, 'Today it will be stormy, for the sky is red and overcast.' You know how to interpret the appearance of the sky, but you cannot interpret the signs of the times. CWRN iron ore mentioned few days ago, chart holding up. Well... its a breakout by the looks of it. Not sure which wave we are in...Wave 3? Anyway, looking good. These are stories of life, of my journey down the road less traveled. Enjoy the stories, listen to the music and learn just a little bit of who I am, what I do, and who I have loved, and lost, along the way.